It looks great ! Can you share info on the material, endmills, settings, etc… ? As a Kiwi living “Down Under” I have to say that is great. Was it done with Vectric software? The frame design is very much in keeping with the artwork itself. Good to see you even got Stewart Island in it. 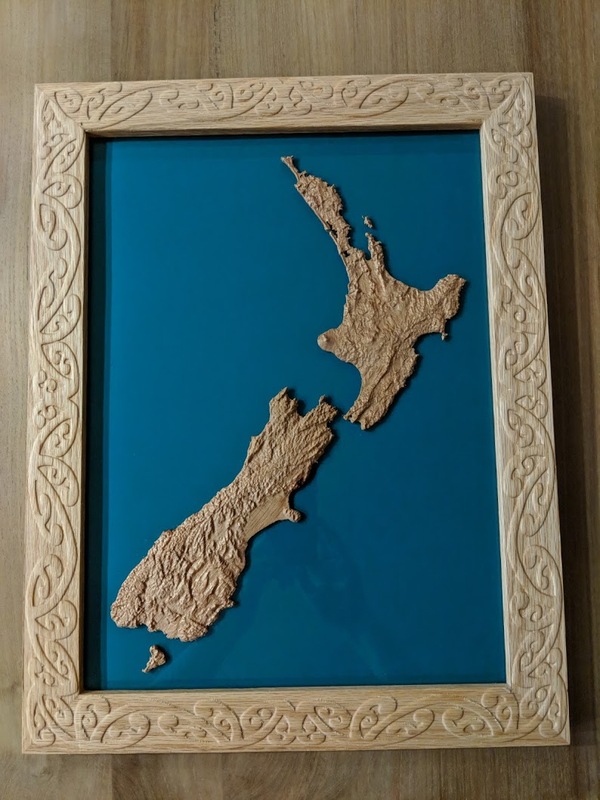 @Julien Map is Spanish Cedar, Frame is red oak. Contours were milled with a 1mm ball end mill and then cut out with a 1mm flat end mill and glued to a sheet of acrylic. The frame pattern was milled with a 1/8th ball end. I’ve written my own software for generating g-code from height maps. As far as missing islands, I drew the line at Great Barrier, I’m missing quite a few smaller ones. Looks fantastic to this Kiwi living in Texas for 20 years! Feeling a little homesick, I was trying to make a NZ relief map this past weekend using STL file from http://jthatch.com/Terrain2STL/ and Fusion 360 for CAM. Didn’t have much luck as F360 was struggling with the complexity of the mesh. Settled for a koru instead! Well done on writing software to solve the problem! I, and I am sure others, love to hear more about your software for generating GCode. It fascinates me what can be done in that way- we have a guy at work (a major hospital) here 3d printing hearts and limbs from CT images. Absolutely brilliant for teaching as they can replicate Trauma to be easily seen. @yug Fusion 360 doesn’t really do a great job with this sort of thing. MeshCAM works fine and for a 1-off you can just use the 15-day trial period. As for the software I’m in the process of writing a simple CAM application somewhere between Carbide Create and Fusion 360 in terms of capabilities. I have a ton of toolpath scripts and I’m gradually getting the UI up and running. I’ll post a beta build once it’s usable. I’ll be following this with interest. I have a free copy of F360 but I am not a fan of cloud based software. I have Vcarve on my list of software and I am currently trying to learn it but just using CC/CM for starters. I was wondering If you might be Mike Smith’s Son.